Whether you are looking for a different kind of recreational activity, wondering how a hydro-electric power generation operates, or just curious where water supply comes from, a visit to some of the most relaxing lakes in the Philippines may serve you these purposes. #1 - Kayangan Lake (Coron, Palawan): This beautiful lake can be reached by some hiking up a hill, which is worth all the sweat as you behold such a totally serene spot as this! You can swim in its warm crystal clear pool of water, which also has some cool areas; snap lots of photos of the beautiful natural scenery with the caves, rocks, greenery all around, awesome top view of the place, etc. No wonder Kayangan Lake is a stunner! #2 - Lake Caliraya (Calamba, Luzon): Though man-made and intended to supply electricity for Southern Luzon, this beautiful lake also offers fascinating water sports/activities that include fishing, wind surfing, kite boarding, jet skiing, and many more! To top it off, the refreshing climate, verdant surroundings and the presence of a lot of resorts around Lake Caliraya, make it such a great place to unwind and bond with your loved ones. #3 - Lake Pinatubo (Mount Pinatubo): Also known as "A Wide Jewel of Blue and Green", top notch Lake Pinatubo can be reached at the summit crater part of Mount Pinatubo, after more than an hour’s drive for any 4 Wheel Drive vehicle up to the drop off point and about an hour’s trek, all these via a trail called Skyway. 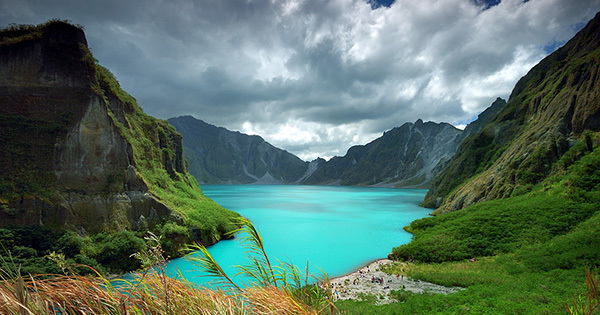 Best visited by avid mountain hikers/bush walkers/photo hobbyists from November up to May each year, Lake Pinatubo promises to wow all its tourists being the deepest lake in the country, that measures a whopping 600 meters! #4 - Taal Lake (Batangas, Luzon): This glorious lake in the Philippines is available for all eager tourists to see as regular boat tours are conducted there whereby they take the guests to cross the lake and go up the Volcano Island through a horseback ride. Also, after bringing them up and down the mountain until Taal Lake comes to a breathtaking view, taking photos is all they’d want to do! But wait, there’s more! Being home to Taal Kite board Association, smashing Taal Lake is thus a nice place to kite board, too! #5 - Burnham Lake (Baguio, Luzon): situated in Baguio City at Burnham Park in northern Luzon, this lake is one of the most popular tourist destinations in the country, where people can rent boats to paddle by themselves at a very minimal cost. It is so interesting to hang out there because of the very cool climate, sometimes to the point of seeing fog hovering in the area especially in the months of December and January. Truly one for the bucket list!